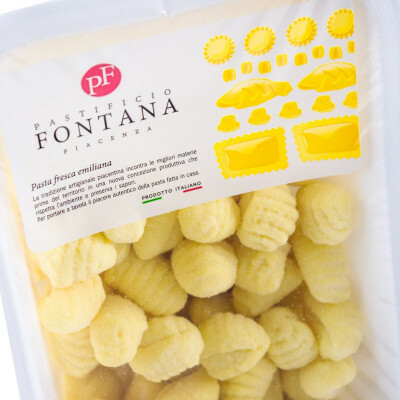 Gnocchi are the Italian version of dumplings: comfort food at its best. 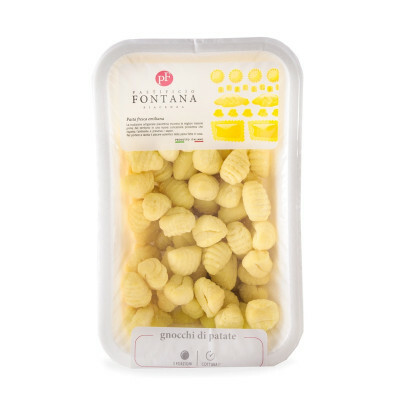 Every single region in Italy has its own recipe for the gnocchi, but no matter where you are, on Sunday every Italian would have a generous portion of these little bites of pure familiar joy. They are so delicate but still so peculiar that they perfectly match any kind of sauce, especially with Bolognese, or tomato sauce. Gnocchi mixture 49% (potato flour 66% (potatoes, emulsifiers: mono and diglycerides of fatty acids ( E 471), potassium and sodium di-phosphates (E450), antioxidants: sodium metabisulfite (E 223), Ascorbyl palmitate (E 304 (i), spices, acidity regulator: citric acid (E330), corn starch, wheat starch, salt soft wheat flour, skimmed powdered milk, powdered egg yolk, seasonings), water, sorbic acid. GLUTEN, EGGS, MILK, CELERY, SULPHITES. IT MAY CONTAIN TRACES OF NUTS, FISH, SHELLFISH. 32 days. To be consumed after cooking. Boiling them in salted water for 1 minute and when emerge, drain them.